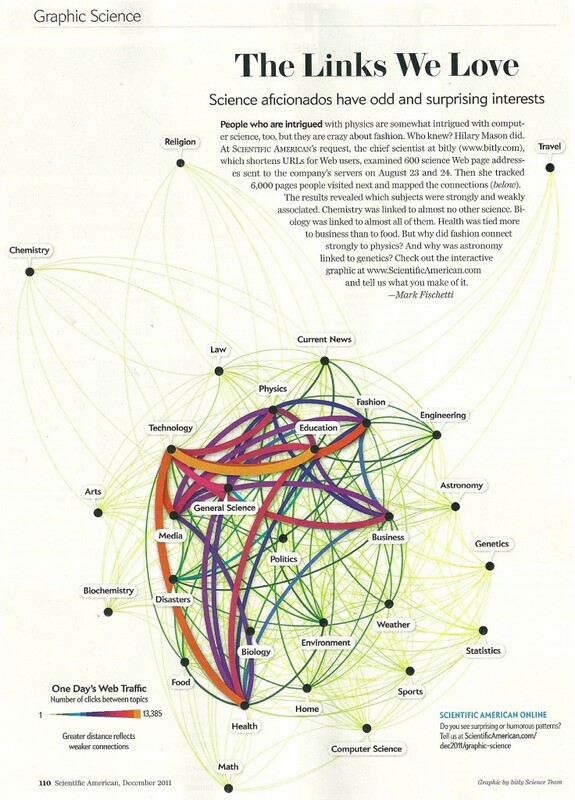 From Scientific American's Dec. 2011 issue. I think the study suffers from using a sample size (600) that is much too small, and much of what we see can probably be contributed to coincidence more than anything. That being said, I don’t think you can look past the obvious connection between people interested in both technology and education. It’s funny, because traditionally education is an under-funded sector that often lags behind business, media, and science when it comes to adopting new technologies. What can account for the strong link between technology and education as shown above? Are a disproportionately large number of teachers using bit.ly? Are we seeing a grassroots movement of education reform, with technologically-savvy teachers using Twitter to network and collaborate? Are private educational institutions with more funds than their public counterparts more likely to be tightly linked with technology? In reality, this is simply a small-scale study that yields more questions than answers. It’s not clearly explained how the sites were categorized, and we can’t hope to make any conclusions from it. But as Marshall McLuhan showed, it’s often more fun and instructive to talk about the questions than the answers. If education really is life itself, as John Dewey said, then technology as defined by McLuhan is certainly forever intertwined with education. The evolution of our technologies has really been the story of the efficiency of information and the literacy we’ve developed to transmit it. Language, numbers, the alphabet, the printed word, and now, media such as Twitter and text messages have increasingly allowed us to transmit more information, while saying and using less. Education is built upon literacy – of numbers, words, and ideas. The forms of literacy have always been evolving as new technologies create new media. From the spoken word to the written word, from the printed word to television, it’s always been the case that we must educate to keep up with the growth of new technology, while being careful to not entirely leave behind what we gained from the old. Of course in the 21st century, with the pace of change relentless, this is harder than ever, but it’s not impossible. All generations have thought their own present time had a pace of change that was relentless.